iPhoto has to be one of the most useful applications of the whole iLife package, on a par with iTunes. Like iTunes it’s program that allows for the storing files using a simple, easy to use format. 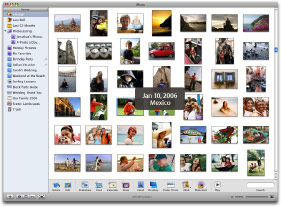 But iPhoto 6 has become something of a grown-up, just like the other apps in this package. 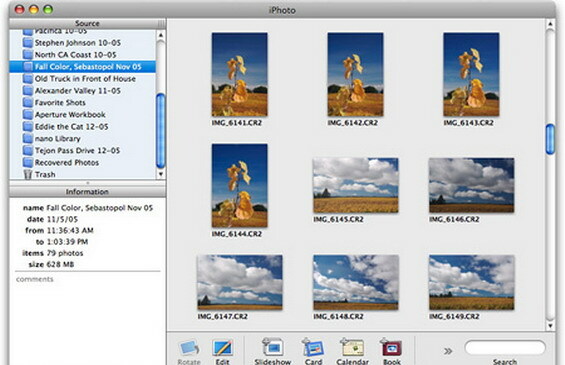 iPhoto now has some additional editing tools that can help touch up your photos. The most important of these tools would have to be the Adjust tool. 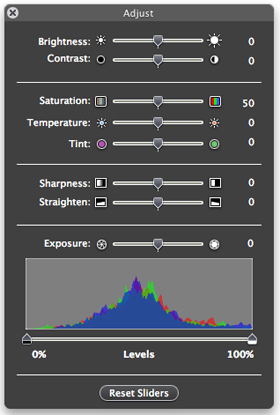 From here you can increase/decrease colour, temperature, exposure, and other aspects of your images. It now means that you can now fix up your photos with much more more than just the red eye, retouch, and enhance tools that we had been used to. While this is great news for the average Joe Blow, it may not be enough for the professional. However iPhoto also has an option in the preferences to allow you to open an external application such as GIMP or PhotoShop so that you can have a more powerful means of editing your photos while retaining the simplicity of how iPhoto keeps them organised. There is another thing that adds a lot of value to iPhoto. iPhoto now has Smart Albums in much the same way as iTunes features Smart Albums that can be created on the basis of a number of criteria. Now you can create albums whose membership is based on a database style search. This is huge benefit because it means that there are a wealth of criteria available to base searches on, such as whether or not the photo was taken with a flash. In another example, a Smart Album can be based on the model of the camera that took the photo, which iPhoto detects. So in the example shown, it has picked up that some photos were from a Canon PowerShot and I can create a smart album of all those images. This means you can make an album and easily sort it by different cameras that you may have used. That can be very handy. 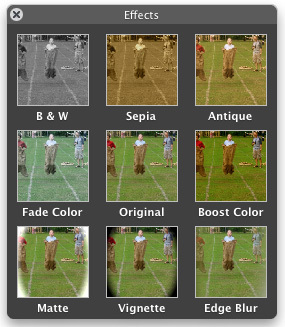 There are also various effects that allow you to change the colours and distort the image in minor ways. Don’t expect PhotoBooth style effects though if you’re familiar with that program, as these are just simple effects and not the image tricks that PhotoBooth provides. Photocasts have been added which allows you to upload photos in an album to your .Mac account and creates an RSS feed so that Safari, FireFox, and other RSS readers can view the photos. Any updates to the album automatically get updated to your .Mac account. You can even subscribe to other people’s Photocasts and iPhoto will show you when they have added images to their albums…almost like a news reader for images. Of course what would an iLife application be if images couldn’t easily be shared with other programs. 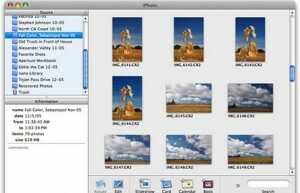 iPhoto is like all the rest of the iApps and can be used within its sister programs iWeb, iMovie, iDVD, and GarageBand. You can also create a calendar complete with appointments from iCal. The downside is that whilst you can print them out, you can’t buy the calendar you create like US customers can. There are alternative Australian sources where you can order these items (in some cases it requires a download of an additional plugin and in others, you email them a fairly hefty PDF). There is another downside. You still cannot save your Library to some other location and load it from there. With iTunes I have my 20Gb of music sitting on a separate drive because I only have a 30Gb drive in my iBook. My iPhoto Library is currently at 4.3Gb so having that off on another drive would be nice indeed. Exporting to CD is still a bit of a pain. It still doesn’t create a Kodak style picture disc so while you can view the images on a DVD player you have to manually find the pictures instead of having the DVD automatically play a slideshow. Instead all the CD that you create is, is just a CD of an iPhoto album. Not exactly a great means of sharing your photos with friends and family unfortunate enough not to own a Mac. That being said though it does make a good backup system so that you don’t lose images in your library. Of course you could burn to DVD as well if your library outweighs a 800Mb CD. All in all, despite a few glitches and annoyances still, iPhoto 6 is a wonderful package and complements every aspect of iLife and other Apple apps such as Pages and Keynote. What do they think about the Photoshop professional reviewers? What would happen to the design, if it was not a photoshop?